With a little comic book flair, this PREMIUM Despicable Me Minion throw pillow captures favorite characters from the film franchise in a colorful 16×16-inch accessory for the Despicable Me bedroom. Find a Minion, an Evil Minion, Lucy, Gru, and El Macho from Despicable Me 2 in clean crisp detailing and vivid colors of purple, red, yellow, white and denim blue providing a wide range of colors to coordinate with other accessories. A stamp for the “Anti-Villain League” as well as edition #2 add to the comic book style with phrases “Is it Minion or Monster” and “Villains as you like them” rounding out the theme. This Minion throw pillow comes with a washable poplin cover and features a concealed, heavy duty nylon zipper so you can remove the cover for cleaning. Inside is a hypoallergenic, down alternative pillow insert, double stitched for quality and overfilled for loft and long wear. Did you know that when you decorate with larger throw pillows, it adds a much cleaner look to the room rather than having a jumble of smaller pillows? Regardless if you choose large or small, a brightly colored pillow fabric can dress up any room up with a little extra splash of eye-grabbing color. 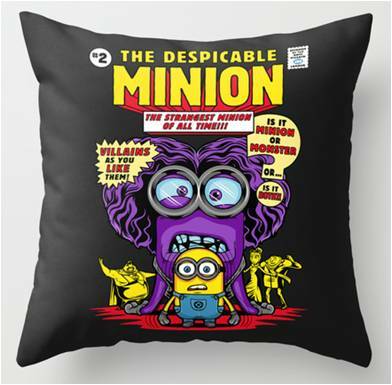 This is a PREMIUM 16-inch by 16-inch throw pillow with a removable zippered cover featuring an artist’s comic book style design of Despicable Me 2 characters Gru, Lucy, El Macho, a Minion and an Evil Minion on a black background. Vivid colors of red, yellow, white, blue and purple pop on the dark background accentuating the artist’s detail. The artist’s design “The Despicable Minion” is two-sided meaning the same design is on both sides of the pillow and is signed by the artist. This decorator pillow cover is made from 100 percent spun polyester poplin making it very durable yet removable for cleaning — it features a convenient, concealed heavy duty nylon zipper. The pillow insert is a high quality hypoallergenic, down alternative that is overfilled and double stitched. For cleaning, simply unzip and remove the cover from the pillow. You can pre-treat any stained or soiled areas with a color-safe spot cleaner or spray. You may also use a damp sponge to remove any stains. Wash the cover in cold or warm water using a mild detergent and do not bleach. Allow it to air dry or tumble dry on a low setting. This Despicable Me 2 pillow is also available in 18-inch by 18-inch and 20-inch by 20-inch sizes. You have the option to purchase it with INDOOR or OUTDOOR spun polyester fabric. Prices will vary based on your selection of pillow size and any other options.